My new book, “Did Muhammad Exist? An Inquiry Into Islam’s Obscure Origins,” is out this week, and it has already aroused anger among Muslims: A Muslim writer named Hussein Rashid, who is an instructor at the Center for Spiritual Inquiry at Park Avenue Christian Church, fulminated in Religion Dispatches that my book on Muhammad will win praise only from the “Islamophobia industry” – as if the book itself were a manifestation of hatred and bigotry. I’m reminded of the words of the Dutch filmmaker Theo Van Gogh as the Islamic jihadist Mohammed Bouyeri began sawing his head off in retaliation for his film “Submission” about the plight of Muslim women: “Can’t we talk about this?” No, we can’t. In America, speaking unpopular truths about Islam won’t get you murdered, but it will get you consigned to the outer darkness, where hatemongers and bigots weep and gnash their teeth. Many people wouldn’t dare write (or read) a book entitled “Did Muhammad Exist?” for fear of getting Muslims angry and getting called names. I, on the other hand, am determined to respect Muslims and treat them as adults. In fact, that’s why I wrote “Did Muhammad Exist?” – for I believe that even in the politically correct United States of 2012, we should be able to discuss in an adult manner the historical evidence for and against the existence of Muhammad. The Scriptures and religious figures of Judaism and Christianity have been subjected to searching historical scrutiny since the 18th century. No one riots, no one threatens, no one gets killed as a result of these investigations – no one rails against the “Judeophobia industry” or “Christianophobia industry.” To be sure, some historical critics have been motivated by an animus toward the religion they’re studying, but no one in the West is interfering with their right to undertake such study. Only around Islam does the scholarly community walk on eggshells. It’s time to stop. Not only should the quest for the historical Muhammad be carried on in our nation’s universities, but we should dare to treat Muslims as adults in other ways as well. Instead of politically correct obfuscation about the political and supremacist aspects of Islam, there should be a vigorous public debate about the ways in which Islamic law, Shariah, is incompatible with pluralistic democracy, and the ways in which Islam is incompatible with Western ideas of human rights. Moreover, as adults we ought not to have to make patronizing references to the “Noble People of Afghanistan,” as Gen. John Allen did in his embarrassingly obsequious apology to the Afghans for the inadvertent burning of Qurans on a NATO base. As adults we ought not to have to pretend that the “Arab Spring” is a glorious flowering of freedom when in fact it is a series of pro-Shariah Islamic-supremacist takeovers. If we treat Muslims as adults instead of as children, we will not turn our heads and pretend that we don’t see when Muslims in Nigeria burn churches and brutalize Christians. Nor will we ignore the Muslim persecution of Christians in Egypt, Iraq, Pakistan and elsewhere. If we treat Muslims as adults, we will not turn a blind eye when Saudi Arabia executes women for sorcery. We will not turn our heads and pretend we don’t see when Muslim countries execute homosexuals. We will not pretend that the Muslim women around the world, and increasingly in the U.S., who are victims of honor killings do not exist and never did exist. Nor will we refuse to listen when Iran makes genocidal threats against Israel. No, if we really treat Muslims with respect, then we will hold them to the same standard as everyone else. We will not kowtow before their expressions of anger and outrage, or curtail our speech or our thoughts in the face of their irrational and manipulative charges of “bigotry” and “hatred.” We will expect them to understand that in a pluralistic society such as ours, we all have to put up with things we don’t like without killing or threatening or defaming one another. “Did Muhammad Exist?” is a book that asks legitimate historical questions that a few courageous scholars have been working on for quite some time. Let’s accord Muslims the respect we would automatically give to anyone else, and treat them as adults who are able to abide the possibility of such historical questions being asked – rather than as tantrum-inclined children around which we all must tiptoe. For insofar as we bow before false labeling or even physical intimidation, we are that much less free. Our guest today in FrontPage interview is Robert Spencer. Robert Spencer is a scholar of Islamic history, theology, and law and the director of Jihad Watch. He is the author of ten books, eleven monographs, and hundreds of articles about jihad and Islamic terrorism, including the New York Times Bestsellers The Politically Incorrect Guide to Islam (and the Crusades) and The Truth About Muhammad. His latest book is Did Muhammad Exist? An Inquiry Into Islam’s Obscure Origins, and that is the subject of our interview today. FP: Robert Spencer, welcome to FrontPage interview. FP: So why did you write this book? This is not a question that most people have ever even considered. Spencer: That’s true, Jamie. The question of whether or not Muhammad existed is one that few have thought to ask, or dared to ask. For most of the fourteen hundred years since the prophet of Islam is thought to have walked the earth, almost everyone has taken his existence for granted. FP: Of course. After all, his imprint on human history is enormous. The Encyclopedia Britannica dubbed him “the most successful of all Prophets and religious personalities.” In his 1978 book The 100: A Ranking of the Most Influential Persons in History, historian Michael H. Hart put Muhammad in the top spot. So how can you say such a man never existed, and why does it matter? Spencer: There is, in fact, considerable reason to question the historicity of Muhammad. Although the story of Muhammad, the Qur’an, and early Islam is widely accepted, on close examination the particulars of the story prove elusive. The more one looks at the origins of Islam, the less one sees. In Did Muhammad Exist?, I explore the questions that a small group of pioneering scholars has raised about the historical authenticity of the standard account of Muhammad’s life and prophetic career. A thorough review of the historical records provides startling indications that much, if not all, of what we know about Muhammad is legend, not historical fact. A careful investigation similarly suggests that the Qur’an is not a collection of what Muhammad presented as revelations from the one true God but was actually constructed from already existing material, mostly from the Jewish and Christian traditions. It matters because my investigations, as the book shows, tend toward the probability that Islam was constructed as a political system foremost, and only secondarily a religious one – a point that has significant implications for the controversy today over anti-Sharia laws and how to regard the incursions of political Islam in the West. FP: Fascinating. So what are some of those indications that Muhammad may not have existed? Spencer: Well, foremost is the yawning gap between the time Muhammad is supposed to have lived and the publication of the first biographical material about him: over 125 years. Imagine if the first account of the life of the Civil War General Sherman, who died in 1891, were just being published now, and in an oral culture in which written records were sparse. It would be only natural to assume that the material in the new biography was at very least a mixture of history and legend. In Muhammad’s case, it is well known and acknowledged even by Muslim scholars that traditions of Muhammad’s words and deeds, were forged wholesale in the eighth and ninth centuries by warring factions among the Muslims, in order to justify their own practices. The method by which Muslim scholars traditionally sorted out those traditions that were supposedly authentic from those that were not was by examining the chain of transmitters – i.e., the list of people who were supposed to have passed on the tradition from the original witness to the present day. But of course such a list can be fabricated as easily as a tradition can be. What’s more, for sixty years after the Arab conquests began in the 630’s, there is no indication either in the extant records of the conquered people or of the conquerors themselves of them coming with a new religion, a new holy book, or a new prophet. Until the 690s, the conquered people refer to the conquerors as Hagarians, Saracens, Taiyaye, or other names, but never as “Muslims,” and give no hint, even in religious polemic, that they came with a new religion. Nor do the Arab conquerors themselves, in their coinage, monuments, or anything else, ever refer to Islam or the Qur’an. FP: That is startling. But why embark on such an inquiry at all? ?Religious faith, any religious faith, is something that people hold very deeply. Muslims will regard the very idea of applying historical scrutiny to the traditional account of Islam’s origins as an affront, won’t they? Spencer: Yes, Jamie, they will. But the questions in this book are not intended as any kind of attack on Muslims. Islam is a faith rooted in history. It makes historical claims. Muhammad is supposed to have lived at a certain time and preached certain doctrines that he said God had delivered to him. The veracity of those claims is open, to a certain extent, to historical analysis. Whether Muhammad really received messages from the angel Gabriel may be a faith judgment, but whether he lived at all is a historical one. Islam is not unique in staking out its claims as a historical faith or in inviting historical investigation. But it is unique in nothaving undergone searching historical criticism on any significant scale. Both Judaism and Christianity have been the subject of widespread scholarly investigation for more than two centuries. Why should Islam be exempt from such examination? And is it still possible in our politically correct world even to raise such questions? The scholars who are investigating the origins of Islam are motivated not by hatred, bigotry, or racism but by a desire to discover the truth. These are the scholars who laid the foundations for the explorations in my book. No one should fear the truth, and everyone should be willing to go wherever it leads them. FP: Robert Spencer, thank you again for joining us. Author Robert Spencer, founder of the major website Jihad Watch, recently published a book with the provocative title Did Muhammad Exist? : An Inquiry into Islam’s Obscure Origins. The foreword was written by the eminent scholar Johannes J. G. (Hans) Jansen, an Arabist and a Professor of Modern Islamic Thought at the University of Utrecht in the Netherlands until his retirement in 2008. Among his other accomplishments, he has translated the Koran into Dutch. Jansen points out that what sparse information and physical evidence we do have does not seem to confirm the traditional Islamic accounts of the sixth and seventh centuries. In fact, archaeological findings contradict the traditional picture. Only further archaeological work in present-day Arabia and Greater Syria can shed more light on these issues. In Saudi Arabia, such excavations are forbidden, and Wahhabi hardliners have actively destroyed some sites. Furthermore, the religious authorities may not be interested in bringing to light findings that might contradict their religious views or undermine Saudi Arabia’s central status in Islam. Moreover, a fully developed Arabic script did not yet exist at the time when the Koran was supposedly collected for the first time, which further introduces substantial sources of error. The Koran itself was probably far less stable and collected much later than Muslims believe. Finally, the hadith collections which elaborate upon the personal example of Muhammad were developed many generations after the alleged events of his life had taken place, and are considered partially unreliable even by Muslims. It is likely that a great deal of this material was fabricated outright in a process of political and cultural struggle long after the first conquests. Spencer does not claim to be an original scholar in these matters, but credits such individuals as Ignaz Goldziher, Theodor Nöldeke, Arthur Jeffery, Henri Lammens, Alphonse Mingana, Joseph Schacht, Aloys Sprenger and Julius Wellhausen, as well as more recent researchers such as Suliman Bashear, Patricia Crone, Volker Popp, Yehuda Nevo, Michael Cook, Ibn Warraq, Judith Koren, Ibn Rawandi, Günter Lüling, David S. Powers and John Wansbrough. Several contemporary critical scholars — Christoph Luxenberg, for example — have been forced to write under pseudonyms due to persistent threats against their lives. This virtually never happened to scholars in Christian Europe who critically examined the Bible or the historical Jesus during the nineteenth century, but it happens frequently to those who question Islam and its traditions. One might suspect that the main reason why many Muslims often tend to react with extreme aggression against anyone questioning their religion is because it was originally built on shaky foundations and could collapse if it is subjected to closer scrutiny. Non-Muslim chroniclers writing at the time of the early Arabian conquests made no mention of the Koran, Islam or Muslims, and scant mention of Muhammad. The Arab conquerors themselves didn’t refer to the Koran during the first decades, quite possibly because it did not then exist in a recognizable form. Islamic apologists love to talk about the supposedly tolerant nature of these conquests. Yet as historian Emmet Scott has demonstrated in his well-researched book Mohammed and Charlemagne Revisited, the archaeological evidence clearly indicates that the Arab conquests caused great devastation to the conquered regions. Furthermore, we must consider the possibility that Islam as we know it simply did not exist at the time of the initial conquests. Modern scholars like Patricia Crone have questioned whether Mecca as an important trading city and center of pilgrimage truly existed by the year 600, as Islamic sources claim. Its location makes no sense if it was supposed to be located on the trade routes between the Indian Ocean and Mediterranean Europe. No non-Muslim historian mentions it in any accounts of trade from the sixth or seventh centuries. Given the centrality of Mecca in traditional history, this casts the entire canonical story of the origins of Islam into doubt. The Koran claims to be written in clear Arabic, but even educated Arabs find parts of it hard to understand. The German philologist Gerd R. Puin, whose pioneering work is quoted by Ibn Warraq in What the Koran Really Says, states that up to a fifth of it is just incomprehensible. Perhaps one of the reasons why the Koran stresses its Arabic nature may be, ironically, that portions of it were not originally written in Arabic at all, but in related Semitic languages. Christoph Luxenberg has suggested that some sections of it were originally written in Syriac, a dialect of Aramaic that had long been used as a literary language in much of the Middle East and the Fertile Crescent. He demonstrates convincingly that certain puzzling Koranic verses make more sense if you read them in Syriac. The virgins that brave Muslim men are supposed to enjoy in Paradise (Koran 44:51-57, 52:17-24, 56:27-40) may not be virgins at all, but rather white raisins, or perhaps grapes. Yes, fruit. It’s possible that some of these Christian Syriac texts were written by a heretical group that rejected the Trinity of mainstream Christianity. It’s certainly true that a few Koranic chapters as we know them are somewhat more tolerant than others, but if we believe this non-traditional reading of history, some of them were based on pre-existing Jewish or Christian texts. In the final section of the book, Spencer sums up the findings to date. He suggests that Muhammad may have existed as a semi-legendary figure, comparable to Robin Hood, King Arthur or William Tell, whose exploits were greatly elaborated upon by later generations. Yet the traditional account of him as Islam’s founder is riddled with gaps and inconsistencies. The Arab conquerors may have known some vague monotheism partly inspired by Christians and Jews, but in the generations and centuries after the conquests they abandoned this and developed a more militant creed that came to function as a vehicle for Arab nationalism and imperialism. Perhaps the conquests shaped Islam more than Islam shaped the conquests. But if someone more or less invented Muhammad, wouldn’t they want to invent a more sympathetic character than the very ruthless and brutal man we see emerge from the traditional accounts? Possibly yes, but as Spencer comments, the Arabs of this age may have thought that such a ruthless character was an inspiration for conquest and empire-building. It’s open to serious debate whether Muhammad ever existed, but I lean towards concluding that he did, at least in the vague sense of a militant Arab leader who helped unify different tribes and redirect their tribal energy outwards towards the goal of external conquest. This would not be substantially different from the way Genghis Khan managed to unify squabbling Mongolian tribes into a viable Mongol nation capable of conquering a vast empire. The major difference is, of course, that a new religion was not built around the personality of Genghis Khan. Perhaps we should be grateful for that. Otherwise, the largest voting block at the United Nations might now have been the Organisation of Mongolian Cooperation, and the BBC and the New York Times would warn us against the dangers of Genghisophobia. Robert Spencer possesses a special talent for presenting complex issues in a way that is accessible and understandable to an educated mainstream audience. His latest work is no exception. Did Muhammad Exist? is a competent and readable introduction to some of the most vexing riddles regarding the true birth of the creed we now know as Islam. A best-selling author questioning the origins of Islam in a new book has received death threats on the Twitter social networking website. Robert Spencer, director of the website “Jihad Watch,” questioned the source of Islam in a new book, “Did Muhammad Exist? An Inquiry into the Obscure Origins of Islam,” published by ISI Books. Spencer is also the author of The Politically Incorrect Guide to Islam (and the Crusades), The Truth about Muhammad (both New York Times best-sellers) and is a columnist for FrontPage Magazine. 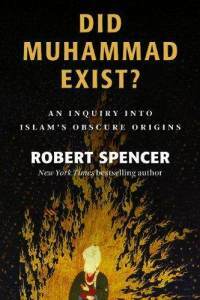 But upon publication of his latest book, which theorized that the founder and prophet of Islam, Muhammad, did not really exist, Spencer was threatened with a violent death. The Twitter account @83_amira has since been suspended.